Years ago I carried an emergency backpack with me. It was a present, looked really professional and cool but it was so huge that there was nearly no space for additional luggage in my car trunk when the backpack was placed there. It was stuffed with a lot of pricy tools as a pulsoxymeter, a laryngoscope, ET-tubes, larynx-tubes, O2-tank, Ambu-bag (Mark V), Samsplints, and so on. After a while two things happened: first of all I became Dad of my first child (a daughter – today I´m the proud dad of four great kids). Belive me, I didnt even start arguing with my wife about the importance of an emergency backpack which was so big that there was not enough space to carry our baby buggy. Not talking about the missing space for any additional luggage. The second thing was that I realized that it was a lot of really booring work to keep track of the f***ing expiration dates of over 100 items. Last but not least storing drugs in a car at temperatures from -15°C in the Winter to 40°C and more in the summer isn´t the best idea too. So I decidet to make a radical cut and removed my emergency-equpiment from my car. 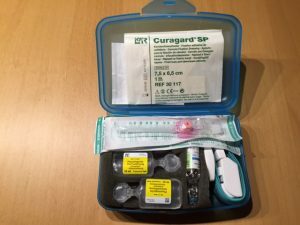 I didn´t carry anything more than the little first aid box which is required by law in Austria this times. I did so for eight years till my second child (a son) broke his arm really bad at a birthdayparty at the hous of a good friend in the countryside. The good thing: Ursula (my friend) is a veterinarian, the bad thing: I sedated my son with veterinary Ketamine (250ml bottle) and had to use a i.v. line usually used for horses. Dont worry – it worked well. 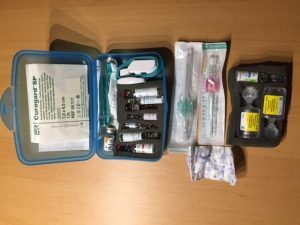 After that I realized that there was a need for carrying emergency-equipment beyond the little first aid box (has to be carried in any car in austria – required by law) with me. I reflected upon it dozends of times and developed my personal emergency-equipment to carry with me. It had to be small and versatile. I wanted only items in it which I could use without the need of monitoring devices. And it had to be small enough to carry it with me in my backbag, shoulder bag, diaper bag and so on. A simple click box. I own 3 identical ones. One placed in my car, one in my everyday shoulder bag and one at home. 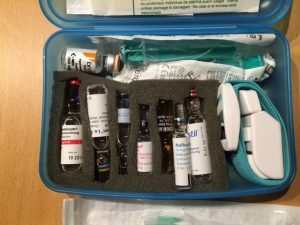 This makes it easy to replace the drugs regularly (usually one unit contains 5 vials – very near to the amount you need to stock up three sets) and keeping track of the expiration dates. The vials are placed in foam-material which I bought at the local hardware store and cutted in shape. So I can treat anaphylaxis, asthma, perform a procedural sedation, provide analgesia, prevent nausea and vomiting (I always apply Ondansetron before using S-Ketamine or opioids in emergency situations) in a very safe manner. 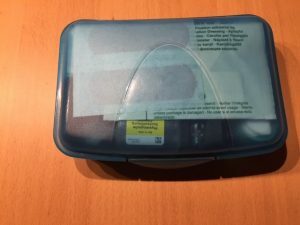 I´ve used this box a lot of times till today. One life could definitly be safed with this minimalist equipment. I was able to treat an severe anaphylactic reaction after a wasp sting in a public swimming bath two years ago. Applying half of the epinephrin 1 minute after the sting intramuscularly and the rest in little boluses iv kept the women alive till the helicopter arrived. Having two iv lines placed before the veins collapsed simplyfied the further management. What do you think? Any further suggestions? What can be made better? I´d love to read your comments.